Move over hamburgers and French fries – a healthy, delicious new restaurant is bringing a fresh alternative to fast food in Lincoln Park. Just steps away from the Fullerton “L” stop, Green Bean, 734 W. Fullerton Avenue, offers fresh, locally-sourced ingredients made to order in healthy, organic meal choices that taste great at affordable prices. Promoting the overall health and well-being of the community, Green Bean offers the most expansive gluten-free menu in the area and is entirely nut-free, revolutionizing fast food with its adherence to the new FDA food requirements and 100% physician approved menu options. 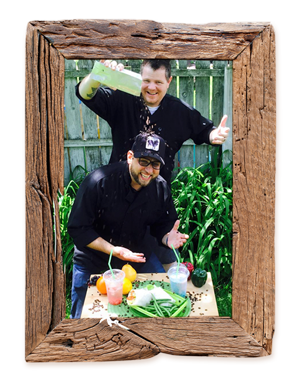 Executive Chef Mike Watson teams with co-founders Aaron Bush, who has a background in both the medical field and food service, and respected Dr. Srinivas Ravanam, M.D., M.P.H., to bring an elite pedigree to the healthy transformation of fast, fairly-priced food. Green Bean is open for breakfast, lunch and dinner, offering an array of nutritious options for diners at any time of day. Seeking a quick pick-me-up? Green Bean offers freshly brewed iced or hot exotic coffee and hot espresso drinks ranging from traditional Cappuccino to Sinatra Black Tie. Delectable lattes, Americanos and Macchiatos are complemented with delicious hot tea choices from Tiesta Teas ranging from Lean Green Machine to Maui Mango, all served in a steeper with loose-leaf tea and embedded all-natural fruit chunks. Creamy Greek yogurt smoothies whip up fresh yogurt with customers’ choices of fresh fruits and vitamin packs. Those seeking a cooler thirst-quencher can sip on iced teas with flavors including Passion Berry Jolt and Blueberry Wildchild. In place of sodas and carbonated beverages, Green Beanproudly serves refreshing Homemade Stoned Fruit Waters, made fresh daily in refreshing flavors Cucumber Cantaloupe, Strawberry Blueberry or Raspberry Mint. For the early bird, Green Bean offers a delicious savory Spanish chorizo breakfast wrap, fresh fruit, and gluten-free muffins. Main dishes for lunch and dinner start at only $6.99 and include a diner’s selection of salads, wraps or paninis with chicken, steak or portabella mushroom. Customers then choose their flavor: Caesar, Asian, Caprese, Spanish, Griller or Greek. Sides include tempura-battered green beans that can convert anyone into a green bean fanatic, a twist on conventional hummus with a black bean base, and sweet potato fries made with just 4 all-natural ingredients and served with chipotle aioli. Other sides include fresh fruit, kale slaw, Japanese rice ramen and seasonal soup. For those with a sweet tooth,Green Bean features three different flavors of imported Italian gelato-filled cupcakes, cake pops and brownie bites. The menu at Green Bean is a chef-driven and spear-headed by Chef Mike Watson, a culinary/baking and pastry graduate of Illinois Institute of Arts, Chicago. In his 20 years of culinary experience, including opening some of the finest restaurants in Chicagoland, he has been inspired by many of the local Chicago chefs who have paved the way to alternative food ideas. Green Bean can bring their healthy menu directly to customers for their next meeting or party with a convenient catering option. Customers interested in catering should contact Chef Mike Watson at 224-828-8376 for pricing and more information. Delivery options are also available based on location. For more information on Green Bean, call 847-366-8899 or visitwww.greenbeanrestaurant.com.